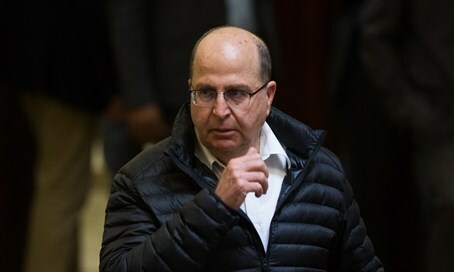 Defense Minister Moshe Ya'alon (Likud) on Monday accused the soldier who last Thursday shot a wounded Arab terrorist of being "not okay," but later on Monday evening he further escalated his verbal barrage against the soldier while speaking at a Knesset plenum session. Ya'alon, who condemned the soldier within hours of the incident last Thursday, again took aim at him by saying, "this is an anomalous incident of a soldier who transgressed and not of a hero." He repeated his criticism against coalition members who gave the soldier backing, slamming the "harsh words and publication of false information, and the manipulation and the attacks against the Chief of Staff - against me is still permissible, (as) a politician, (but) against the Prime Minister and the Chief of Staff (is not)." In the incident a soldier shot a wounded terrorist, minutes after the latter together with an accomplice stabbed and wounded a soldier in Hevron. The soldier was arrested and currently faces murder charges. The soldier insists he shot the terrorist over concerns he was moving to detonate a bomb belt that was thought to be hidden under his unseasonable coat - that version of events was corroborated on Monday by a Magen David Adom investigative committee, which found concerns that the terrorist was hiding a bomb had not been ruled out. Ya'alon on Monday night continued his invective against the soldier, turning to the MKs and saying, "gentlemen, what do you want here? An army that becomes bestial? An army that lost its moral backbone? I am proud that the company commander indicated that it was an anomalous incident." In response to Ya'alon's statements in the Knesset, the soldier's family said, "we are sorry that the Defense Minister continues to wage a campaign of conviction on the back of our son instead of giving him backing as a combat soldier." The soldier's mother wrote to Ya'alon on Saturday night, in a moving letter in which she reminded Ya'alon that when he was the commander of Sayeret Matkal he confirmed the killing of the terrorist Abu Jihad by shooting him after he was already shot. She noted the hypocrisy of Ya'alon's condemnation of her son. In the Knesset Plenum on Monday night, Education Minister Naftali Bennett (Jewish Home) took issue with Ya'alon, saying, "a Defense Minister of the state of Israel determines that he (the soldier) acted in an immoral way. What's more, he also criticized me for calling the father of the soldier. I say here that I will call not just once or twice." "The investigation has not yet started and everyone from all sides is condemning. Tell me, what chances are there of a true investigation after the entire state of Israel determines that the soldier committed a crime? Maybe the soldier made a very large mistake, and I don't determine that he is a hero. The minimal thing that a soldier deserves is the right to an investigation before being convicted," said Bennett.